24-year-old Malti Sahu is from the village of Sukuladaiyan in Rajnandgaon district. Her husband is a driver. He barely earns six thousand rupees per month. Her mother-in-law and brother in law also live with them in the same house. It is not easy to run a family with 6000 rupees. To meet basic needs, they had to work as daily wage labourers too. 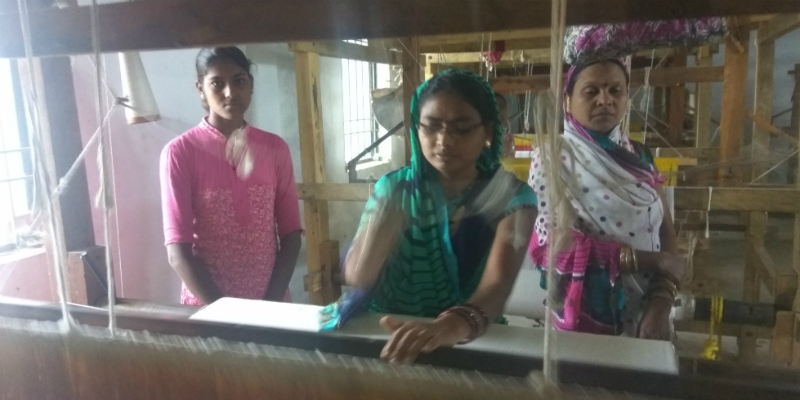 But as soon as the district administration introduced handlooms to empower the women of the village financially, Malti Sahu was very relieved. She too, like other women of the village, works on handlooms set up by the District Administration and Weaver Co-operative Society in the village. The government provides her the thread and Malti has to weave out clothes using it. The finished product is bought back by the government. Malti is making eight to ten thousand rupees every month while weaving cloth on handloom. This has improved the financial condition of her family. Many women like Malti Sahu are benefited from the new handloom policy of the Chhattisgarh government and their economic and social status has become very strong. The important thing is that in Chhattisgarh, more than 3.5 lakh people are leading their lives through small cottage industries and small businesses in rural areas. These include handloom weavers, women engaged in sewing uniforms, kosa producing farmers, potters and handicraft artisans. Many schemes are being run by the Chhattisgarh Government to improve the economic condition of weavers and provide them continuous employment. Under these schemes, training, skill up gradation, grants-in-aid, low interest rate loans, yarn supplies, workshop grants for textile dyeing and better remuneration are being given. There are 230 handloom weaver’s cooperative societies in the state, in which more than 51,000 weavers are weaving different types of clothes. Clothes made by weavers are purchased by various departments under the Shaskiya Vastra Apurti Yojana. Apart from this, clothes made by the weavers are being sold in handloom garments exhibitions organised on various occasions. Uniform fabrics are also prepared for school children by the women from the women’s Self Help Groups and are supplied to the School Education Department. In the financial year 2016-17, 47 lakh uniform sets have been prepared by about 6,000 women of 660 women self-help groups. For this, a sewing remuneration of 16.33 crore rupees was provided. Under the various components of the schemes of handicrafts, silk, matikal and khadi-village industries, more and more people are getting employment in rural areas. A blanket processing unit has been established at Amurgaon in Churia development block of Rajnandgaon district at a cost of 4.55 crore rupees. This gives jobs to blanket weavers. 2.5 lakh blankets have been processed by the weavers and supplied to different departments. Earlier, these had to be sent to Panipat (Haryana) for processing. Under the National Handloom Development Programme, Government of India, handloom clusters are operated in the nine development blocks of the state - Dabhara, Bhamhindeeh, Navagad and Baloda district, Janjgir-Champa, Churia district, Rajnandgaon, Balod district, Balod, Kartla district Korba, Kurud district Dhamtari and Bijaigarh district in Bulaudabazar. Through these clusters 1,620 weavers are being trained in knitting, dyeing and design by excellent designers. In order to encourage weaving art, every year the best two weavers are given Bisahudas Mahant Award of one lakh rupees each and Deendayal Handralaka Award for two other weavers. Similarly, every year, the best eight artisans are awarded twenty-five thousand rupees. Apart from this, the talented children of the weavers are given the Shiksha Protsahan Award. In the last five years, 3,383 children have been rewarded.